What drives innovation and performance at the world’s leading companies and from the top leaders? Author and consultant Simon Sinek made a discovery several years ago about the pattern under which all great and inspiring leaders and organizations operate – they all think, act and communicate in the exact same way. And he discovered that it is the complete opposite of way that almost everyone else behaves. In essence, Simon’s theory challenged traditional assumptions about how great leaders and great companies actually inspire people. 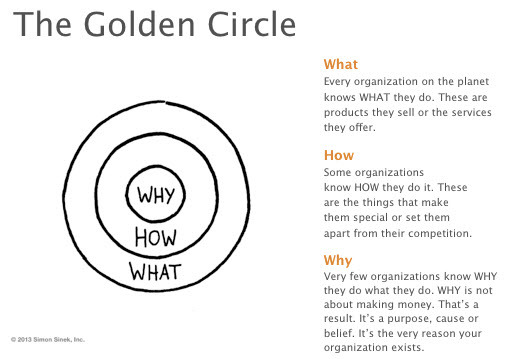 Simon refers to his discovery as the Golden Circle. Everyone knows what they do and most people can explain how they do something, but very few people or organizations can articulate why they do what they do. By “Why”, Simon is referring to: What’s your purpose? What’s your cause? What’s your belief? Why does your organization exist? Why do you get out of bed in the morning? And why should anyone care? Most of us communicate and act from the outside in, because it is generally easier to go from the clearest thing (the What) to the fuzziest thing (the Why). The difference is that inspired leaders and inspired organizations all think, act and communicate from the “inside out”. In other words, these individuals and companies start with the Why and everything else they do follows from the inside out. The goal for inspiration and innovation then, is to sell to people who believe what you believe. Leaders and organizations who inspire us are followed not because we have to follow them, but because we want to follow them. Simon’s TED video below is the second most watched TED video and you can watch how he reinforces his Why-How-What mantra with examples from Martin Luther King, Apple, and the Wright Brothers. Simon distilled his thoughts in his 2009 book called “Start With Why” and you can download a free chapter at the StartWithWhy.com website. Simon just came out with a new book in January 2014 called “Leaders Eat Last: Why Some Teams Pull Together and Others Don’t”. This entry was posted in Uncategorized and tagged Great Leaders Start With Why, innovation, inspiration, Simon Sinek, Simon Sinek's Golden Circle, Start With Why, what makes innovative companies, why is a leader inspire us. Bookmark the permalink.